The work of beloved author Roald Dahl has a vivid cinematic history. As the writer of some of the most epochal children’s literature of the past century, Dahl’s work has been rightfully praised for its imaginative characters, immersive worlds and a sense of humor that doesn’t condescend to a younger audience—but may also keep them up past bedtime. As such, it’s been fertile ground for cinematic adaptations, attracting idiosyncratic directors including Nicolas Roeg, Wes Anderson and Danny DeVito. Steven Spielberg, a director whose reputation precedes him as a master of wonder, is a welcome addition to that list. But while Spielberg’s new adaptation of Dahl’s celebrated 1982 novel, The BFG, is speckled with signature moments of scale and grace that characterize both Dahl’s and Spielberg’s respective output, The BFG fails to convincingly evoke danger, and as a result, falls unusually flat as a satisfying narrative. In most modern cases, the weightlessness can generally be attributed to technology. In the past decade, there have been dozens of films ruined by computer animation that trades clutter for any sense of believable physical weight to the movement on screen. But The BFG doesn’t have issues of visual artificiality, even as it relies completely on the believability of a friendship between Sophie (Ruby Barnhill) and a 25-foot-tall, Dumbo-eared, avuncular CGI giant (Mark Rylance). 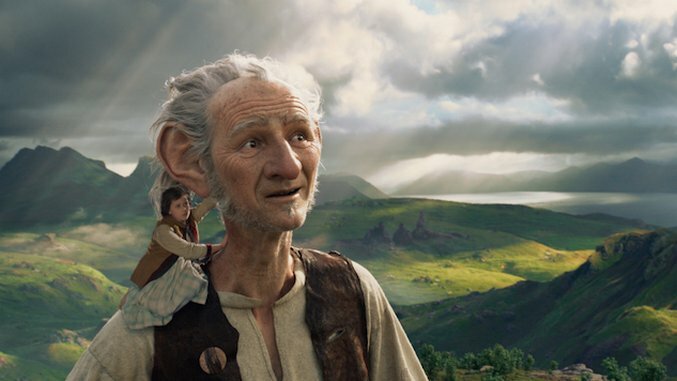 Taking place mostly in a mythical place called Giant Country where the landscapes are endlessly steep, and even the composition of a cottage is transformed into a jungle gym thanks to its colossal sense of scale, The BFG constantly teeters on the possibility of falling apart—but thanks to Spielberg, none of these scenarios feel goofier than they should. Shot by perennial Spielberg cinematographer Janusz Kaminski, early scenes set in London evoke the dreary mystery and hushed isolation of Sophie’s life as an orphan. Elsewhere, Giant Country is a place of dulled but vibrant grays that bloom into starbursts of color at all the right moments, as the giants stampede through the grass. Spielberg sets up elaborate set pieces in which the pint-sized Sophie is thrown around rooms where every household object is multiple-stories high and threatens to trample her. It’s here that The BFG lives up to the pedigree of its talented director, the camera lucidly following her around corners and into crusty crevices. All of the aforementioned scenarios are tailor-made for a cinematic magician like Spielberg, and that’s the exact problem. There’s rarely a moment when The BFG isn’t pushing (in most cases) a watered-down version of Spielberg’s emotional pyrotechnics. This is another story of a heartfelt friendship between outsiders that’s threatened by malicious forces. The narrative has been so internalized in Spielberg’s filmography that he could direct this in his sleep. Subsequently, The BFG, with its unhurried pace and confident direction, feels much more at ease with itself than the vast majority of kids films, but it’s also a widescreen expansion of Spielberg’s worst instincts. Backed by the expansive John Williams string surges and winsome choir, the film constantly pushes forth a sense of spectacle but rarely feels like it’s earning it. Even potentially new visual conceptions—like a dreaming tree around which colorful whispering sprites whiz—feel strangely tired and detached from the main storyline. Adapted by Melissa Mathison, best known for writing E.T. the Extra-Terrestrial, the script often feels caught in this limbo between literary richness and the demands of a fast-paced blockbuster. In particular, a superfluous scene in the middle nearly grinds the film to a halt, and distills the problems between the script and the direction. The scene is meant to underline an earlier conversation, but it’s one of a number of times in the film that seem placed for convenience as opposed to rhythm. It’s all the more distracting that it comes right before one of the best scenes in the film, during which shadow puppetry and dreams are intertwined. Coming off the unassuming pathos of last year’s Bridge of Spies, Rylance is expectedly fantastic as the Big Friendly Giant—an actor who brings a soulful melancholy to dialogue that’s often little more than a string of amiably delivered Jabberwocky-esque gibberish like “vegeterribles” and “whizpoppers.” And newcomer Barnhill, working to elevate her spunky archetype, holds her own alongside more seasoned thespians, but not much of The BFG feels like it amounts to much of anything. It’s the work of a director who still knows how to wave his wand and conjure magic, but to what end? The BFG seems unsure.